KSHETTRA (the Sanskrit word “kShetra” means “field, area, tract of land” and denotes a holy precinct or temenos) is an instrumental rock-band from the city of Zheleznodorozhnyi (Moscow region) that combines in their music various subgenres including jazz fusion, progressive rock, avant-garde, experimental and heavy rock. It was formed in 2007, initially as a duo of bass-player Boris Gas and drummer Victor Tikhonov. 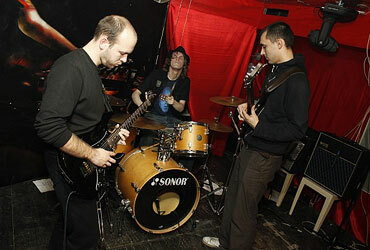 In 2009, in a trio with saxophonist Boris Pepelin the band recorded their first demo and suddenly dissolved. In late 2010, renewed KSHETTRA returned to gig activity with guitarist Nikita Gabdullin on board, and start recording their debut album. Band's official Facebook page. "In a slick and tasteful way Kshettra have unwittingly created their own special offer. Forget hyped numbered limited editions, Kshettra have found another way to entice listeners and collectors alike. Each copy of their debut full length CD is adorned with a unique piece of original artwork by Mila Kiseleva. The results are undeniably attractive and in years to come might even be collectible... The music has numerous positive attributes. Kshettra have created an album of enjoyably measured complexity and appealing originality. It contains an enticing cocktail of progressive rock, post rock and carefully constructed jazz rock. The majority of the compositions contain recurring musical motifs. Melodies are developed and improvised primarily by Gabdullin using a range of tones and textures. His delicate and tasteful playing is stylistically closer to jazz guitarists such as Gilgamesh's Phil Lee. Sensitively picked notes abound, embellished with tasteful variations in loudness and pitch. As a contrast there are some unexpectedly raw fuzz laden solos and occasional moments of heavier guitar riffs to appreciate. For the most part though,what is on offer is cerebral and reflective music. The ambience that is skillfully created invites the listener to turn down the lights and be taken on a journey of the imagination into the unknown and beyond. The impressive guitar parts are underpinned by the booming yet melodic bass of Gas whose excellent contribution combines subtle flair, and foot tapping gusto with consummate ease. Equally noteworthy is the busy and efficient percussive work of Tikhonov... I thoroughly enjoyed reviewing Kshettra's debut album. I would imagine that DPRP readers who enjoy meditative jazz rock with hints of restrained energy and power might find that there is much that might appeal throughout this release. 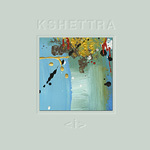 I have no hesitation in recommending the music of Kshettra, you even get a piece of art thrown in for free. I look forward to Kshettras next release with eager anticipation. I wonder what the special offer might be then? (Conclusion: 7.5 out of 10)" – by Owen Davies at DPRP (UK) (July 2014). The album was also reviewed at: Musikrevews.de (Germany), Babyblauen Seiten (Germany), iO Pages (The Netherlands), New Underground Music (The Netherlands), Progwereld (The Netherlands), Far From Moscow (USA).